Mikatan has finally pulled the curtain off this set. Yep, Nendoroid Petit: Fate/hollow ataraxia got a preview photo session treatment by Mikatan yesterday. The curtain of fate has opened once more! With Fate/Zero’s second season underway the ever Fate series is as popular as ever, and now the characters from Fate/stay night’s fan disc, Fate/hollow ataraxia are coming to join the Nendoroid Petite series! The set includes Saber, Rin Tohsaka, Sakura Matou and Rider all wearing adorable maid outfits, along with figures of Illya, Caren, Taiga Fujimura, Bazett, Leysritt, Stheno, Saber Alter and even one secret character that you can get your hands on. Enjoy the quest for yet another Holy Grail in the cutest form possible! Each box containing single Petit will cost you 500 Yen, and they will be available on July. 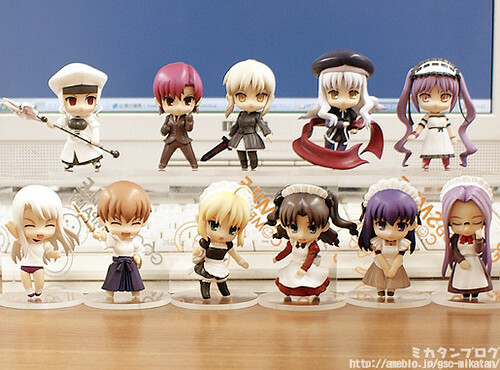 This entry was posted in News and tagged fate hollow ataraxia, nendoroid, petit, puchi.